Eleven days ago I hopped into a plane in A Coruña. That was the first part of a trip that would take me to Barcelona, then Athens, then the island of Naxos, in the Aegean Sea. We were going to have another International Pizza sprint, but that's a totally different story, I just wanted to add some context for this short story. Yesterday I arrived in Piraeus around 15:00, as part of my trip back home. I did step down the boat (Blue Star Naxos) and I went to the Piraeus Metro station. I was a bit excited. Moving around big cities is something that always excites me, specially if I'm not in a hurry to get quickly somewhere. I like to take my time, see what is happening around me and try to stop and watch even the smaller details. Before going to the Metro station, I gave my bigger backpack to my friend Panos, so he and Oscar could take it on their motorbikes. Then I picked up the smaller backpack and a bigger piece of luggage, one of those harder suitcases with wheels (that they couldn't carry on the motorbikes). I also checked I had a book with me, real paper book this time, it was a novel from Haruki Murakami, Kafka on the shore. 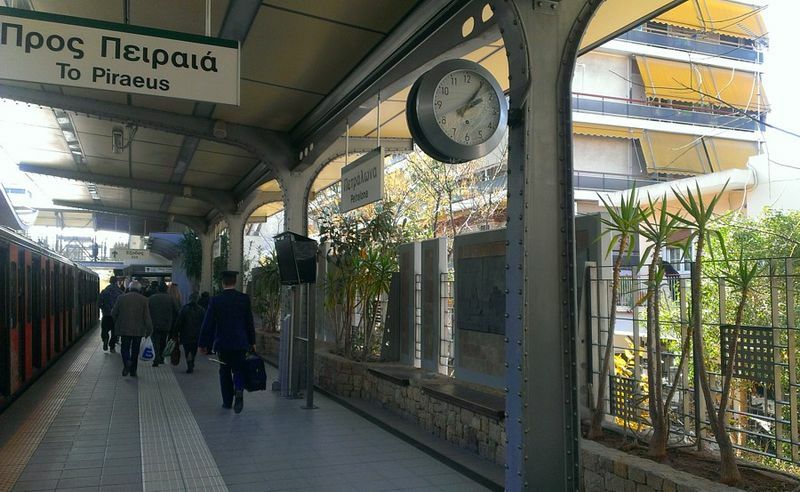 In Piraeus I bought a single ticket - "ένα εισιτήριο παρακαλώ" - I told the woman behind the desk, trying to put the little greek I know into good use. At this time of the year, at that time of the day, nobody was there to buy tickets so it took less than a minute. I got my ticket and I stepped into a wagon of the train for the L1 line which, after around 10 minutes of wait, got me right away to Monastiraki Station. 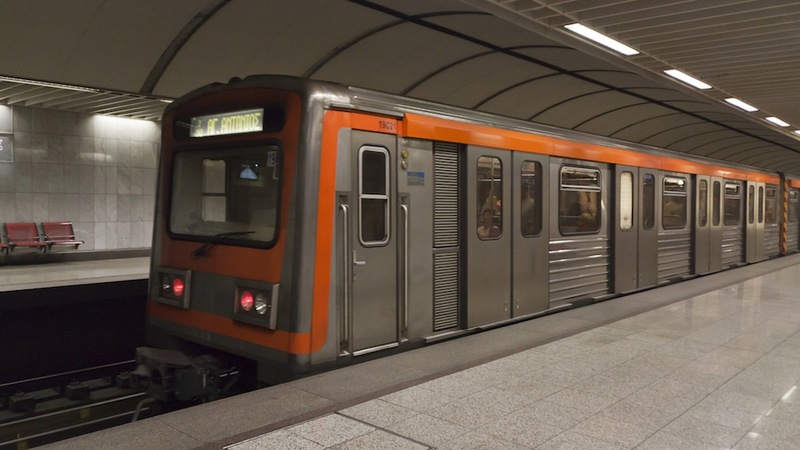 This line, up to Monastiraki, is not the usual Metro line, subway-like, underground. It goes all the time outside (at least until Monastiraki), so you have some nice views from the train (specially near the stations of Kalithea and Petralona). Even having some nice views, I couldn't stop looking around me, tracing the faces of the rest of the people in the train. I know I shouldn't do that, and maybe one day I'll get in trouble because of it, but it can't be helped, I can't stop looking into them, trying to imagine where they are going or how their lifes could be like. On each stop, more and more people were coming in. When we got to Monastiraki the train was full already, and luckily I went down there, as a lot of people was waiting to get into the train. I took my time and walked calmly towards where I should take the L3 line, towards the Airport. To get there I had to go downstairs for a couple of times. When I got to the first set of stairs, a huge queue could be seeing where the automatic stairs were going down. I took the suitcase on one hand and I started going down the regular/non automatic stairs. What a picture, full crowded narrow automatic stairs vs lonely guy walking downstairs with a big suitcase on his hands. Then I had to wait like 15 minutes until the next train would come, so I took Murakami's novel from a pocket and started reading. Five minutes later I noticed the metro stop was totally filled up with people. Some where chatting, some other rushing through the crowd. Some girl started laughing out loud. Then a train arrived. Lots of people got out of the train, then almost everybody around me got into the train. It was like watching a tide, one of those big/strong ones, when the sea gets for quite the distance into mainland, then retreats. It was not my train, so I waited, lonely again in what looked like an empty tube sitting below the busy city of Athens. When my train arrived, the stop was full with people again. I managed to get in and I found a good spot to just stay for the long trip ahead (~50 mins). It felt totally like being in a can of sardines (well, at least I guess the sardines would feel like that if they were alive). On every stop more people were coming in, but not much people was leaving the train. At least it was not too hot in there. I closed my eyes for a moment and I got traces of conversations around me, everybody talking fast and loud. Greek, English, German and French, those I did recognize. A couple of tall, blue-eyed blonde women were talking in some language totally strange to me. Several stops later, almost everybody was gone. My stop was the last one before the airport, Koropi, and the few people that was still in the train stepped down in that stop too. At Koropi Panos and Oscar picked me up with the car, for the next part of the journey.